Birthdays, Bachelorettes, Company off-sites & More! KitTea is a relaxing way to spend an afternoon. Home to 16 - 24 highly social, adorable cats. With thoughtful provisions — menu here. The Cat Lounge can comfortably accommodate up to 14 cat-loving humans. 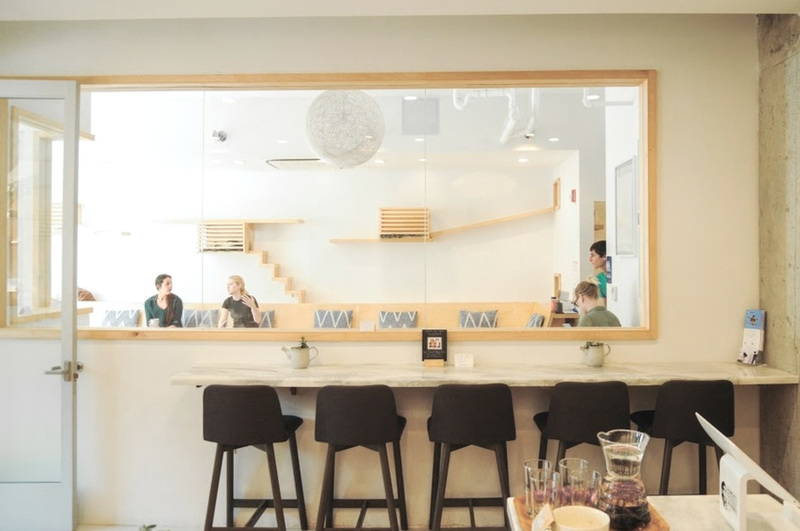 While our cafe is cat-free, there are sweeping views of the Cat Lounge through our oversized viewing window (seating for up to 16, room for up to 20). Everything on the left, plus the cafe is all yours. Cakes, pies, cookies, etc. provided by our talented partnered pastry chef Native Baking. Please, tell us about your special day. Who or what are you celebrating? Please include number of adults and number of children. Please note the day, date, and time (e.g. Monday, 5/1 @ 2pm). Note: 1 adult should be present for every 4 children. Have you visited KitTea before? * Yes Not yet! Thank mew! Our Events Coordinator typically replies on Tuesdays and Thursdays. Please email events@kitteasf.com directly to follow up as needed. Meow for now! At least 1 adult should be present for every 4 children (under 14) in the Cat Lounge. Additional FAQs and information about what to expect can be found here.